There is a great deal of hand wringing in Congress over the deficit. Frankly, I don't think anyone, except maybe Rep. Ron Paul (and I'm not sure he's connected to reality 85% of the time), is serious about the deficit, but they know that it is the number one reason voters are likely to toss them out come November so they are talking a good game right now. Let's look at some numbers. Please understand that I'm not an anti-deficit freak so I'd be comfortable running a $200-$300 billion deficit in the US. So how do we close the gap between $200 billion and the projected trillion dollar deficits? For ease of analysis assume TARP goes away and Interest can't be changed (actually interest costs will be rising in coming years, but we'll cross that bridge when we come to it). That leaves roughly $800 billion to be cut from Defense, Social Security, Medicare, Other mandatory (other discretionary has already been frozen). Well, it wouldn't be popular, but given this chart I'd say the DoD would be first on my list. It takes a strong country to admit a mistake. Our Defense Department has become a Department of Offense and it's needs to be scaled back. I'd start by cutting the defense budget in half. That would get us about halfway to the goal (around $400 billion). We'd still be spending almost 4 times what the Chinese spend on defense. Then, I'd cut Medicare/Medicaid by $100 billion and take $100 billion out of Social Security and raise taxes by $200 billion. That's easier said than done. Every one of those suggestions would get you voted out of office by some wingnut group attacking you as being unAmerican for cutting DoD's budget, raising taxes or forcing Granny to eat cat food because you cut her social security check. Sorry, but I think it's unAmerican to spend money I don't have. I think it's unAmerican to reward ignorance and sloth. You didn't realize your "30 year fixed" was really an option ARM with negative amortization? Too bad, guess your going to be a renter for awhile. My point is that we are not going to be able to "cut waste and spending" back to get our budget back in balance. Hopefully, these numbers show you how impossible it will be to cut our way back to fiscal health. The is no courage to make hard political decisions. We are going to need to grow our revenue base through tax collection without raising taxes (which is relatively easy when revenues and incomes are rising). Do you have a better idea? There is a basic rule of thumb that mfg dollars roll in the economy 7 times before they disappear. One then has to wonder, how many times DOD dollars roll, and what is the next effect of said expenditures and/or its elimination. Is the spending on DOD (manufacture of millitary equip) supplying food and logistics, pay to soldiers and their dependants, etc more or less of a drain then say for example paying x dollars in medicade to replace the worn knee of an 80 year old? If you took $400bil out of the budget for DOD spending, how would you replace those millions of lost jobs and / or replace the net effect of that revenue ultimately returning to society in the form or taxes collected on those dollars, and the goods and services bought by the after tax segment, which then rolls again. One almost has to wonder if you took out $400bil, would it not cost $400bil to do it? It's kind of like the "spend your way out of debt" theory. Good point and I wouldn't expect DoD spending to go away, I just think it's a question of scale. 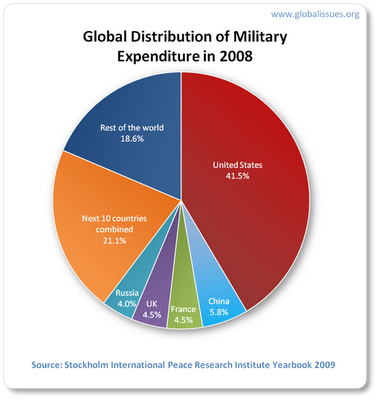 As recently as 2002 the Defense Department's budget was $330bil (not inflation adjusted). Today it's almost $800 bil with Defense-related expenditures outside of the Department of Defense constituting another $216 bil - $361 billion, bringing the total for defense spending to between $880 billion and $1.03 trillion in fiscal year 2010. Within 3 years the interest on the debt related to defense related activities is going to be over $300billion annually.